So I’m sitting in the hospital waiting room with time to kill before I see my consultant. I’ve just been given news that things may be more serious than I thought, and my mind is spinning. This time, there’s no catastrophising (a spiral downward of predictive negative thoughts, ending without doubt in this situation with me dying) – I know I’ll be OK, but I can’t get it all out of my mind. Decisions will have to be made about surgery and I am upset. I hold back the tears. And then I say to myself what would I advise a friend to do in this situation? I go for a walk, some fresh air can’t harm, and I gather my thoughts. Rationally and sensibly I collate questions I need to ask, explore branching options and outcomes. Sorted. I return to the waiting room. My thoughts are still spinning – they have been hi-jacked. It’s like a hamster on a wheel… all roads lead back to repetitive thinking patterns, over and over again. Let’s not feed the hamster I think, let’s distract. I open a piece of challenging work on my laptop (my devices are never far away!) and I start to concentrate. I calm down, my focus is intense. Slight wavering back to doctors, illness, medications. Return the focus to the document Sally – and I am back on track. Breathe; focus. Sixty minutes later, as I walk into the consultant I am calmer, and clear with my questions. For me, distraction has worked. And even better, the news from the consultant was positive, so I have avoided a bigger load of unnecessary worrying. Often we talk about people using distractions negatively to avoid addressing underlying or important issues, but according to Dr Jane McGonigal, distractions (when used well) can also be a useful tool for reducing the impact of negative experiences. In one experiment a group of children were given anti-anxiety medications before surgery, another group played hand-held video games, and a third control group had nothing. Only the ‘distracted’ group showed a decrease in anxiety pre-surgery – and they also required less anesthesia during the op! 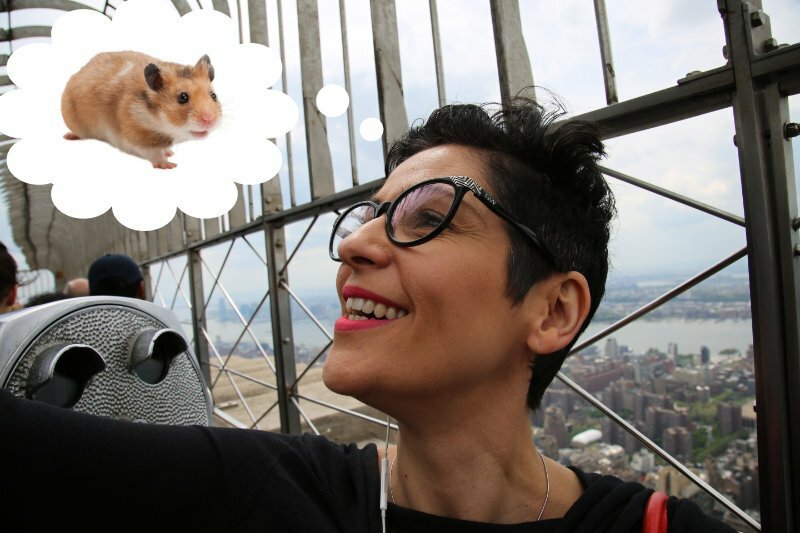 Back to my week – and I found myself today with a different hamster paying a visit. I made a stupid mistake in a work email message, and as I heard the whoosh sound whoosh, I knew the email had sent, and this wasn’t good. I could feel the panic kick in – it had gone. What wasn’t normal was that four hours later all roads led back to the email. What was the worst that could happen? The recipient would think I’m an idiot, careless, bad at my job maybe. I’d lose work even. But, despite this, however crazy I knew it was, it felt like it was the end of the world and the looping thoughts continued, draining me, with no resolution or action to be had for now – that was the hardest, all control had gone. So what should I do to stop these habitual thinking patterns? Now advice ranges from focusing on the present, writing things down, talking it through or breathing. None of which seemed to be helping me since the hamster wheel kept turning. So then I thought focused distraction. Do some research for the Happynesshub! So seven hours later and I am writing to you. Distraction has broken me out of the cycle, taken me out of my spinning thoughts. I feel distanced from the email; it seems more in perspective. And I am ready to effectively breathe now (back in a mo). OK – only 2 minutes of breathing and I feel even better. Conclusion? Distraction can be a useful tool when used mindfully and temporarily. It’s not an avoidance tactic like drink, or drugs, it’s a conscious re-focusing on something that requires cognitive thought and directed attention. I’m off to have a bath with candles, listen to a happy song, call my Mum (all on my happy list), and put the day to bed. I know that the email will not yet be in the trashcan in my head, but the hamster is definitely intermittently taking a rest, and will be waving farewell soon. Loved your distraction story Sallyann…so much of it resonated with me!!!! I will use Betty and Uggie as my hamsters to distract me! Hope you’re feeling a little better now!